In Ontario there is a pressing need for legal services that can be accessed by all, including low-income and disadvantaged persons. Many lawyers are stepping up and trying to address this gap through free services, discounted fees, or by providing legal education to members of the public. Whenever legal services are being provided it is important to consider and know the risks you’re facing: no matter how well-intentioned parties are, things can go wrong. Knowing how your primary professional liability insurance is expected to respond should give you direction and peace of mind when giving back to your community. The availability and terms of professional indemnity coverage for pro bono services vary depending on the insurance status of the lawyer, the context in which services are provided (through Pro Bono Ontario or not), and finally, on the nature of those services (whether they fall within the LawPRO definition of professional services). See below for details on the scenario that best describes your situation. Your standard professional liability insurance coverage will generally cover you for both paid and pro bono professional services. All terms and provisions of your LAWPRO policy apply (e.g., deductible, claims history levy surcharge, etc.). 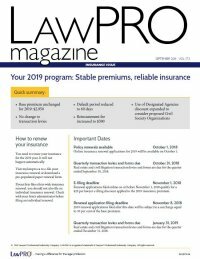 As an encouragement to provide pro bono services, you are not required to pay a deductible or claims history levy surcharge associated with a claim if it arises from pro bono services you provide for a LAWPRO-approved pro bono program associated with Pro Bono Ontario (Download full list of programs in PDF). Furthermore, if you apply for the Part-Time Practice Option, you will not be required to consider any hours of professional time or past claims relating solely to these professional services in your application. If you are exempt, and also provide approved pro bono professional services through a LAWPRO-approved Pro Bono Ontario program you have the standard Run-Off coverage of $250,000 per claim/in the aggregate (unless you have increased the limits by purchasing optional Increased Run-Off protection ) and you are not required to pay any deductible for claims relating solely to such professional services. Coverage applies to professional services provided through approved programs associated with Pro Bono Ontario, and does not include legal work beyond that provided for the Pro Bono Ontario program (Download full list of programs in PDF). If you provide pro bono professional services for not-for-profit organizations not associated with Pro Bono Ontario you may continue to qualify for exemption; however, you will not be insured for these pro bono professional services. You must complete an application form prior to engaging in the pro bono professional services not associated with Pro Bono Ontario. The LAWPRO policy will not provide coverage if a claim arises relating to your pro bono professional services. You will be responsible for all defense and indemnity costs associated with the claim. If you provide professional services on some other pro bono basis, you are considered to be in private practice, and must pay the insurance premium. Therefore, if you provide professional services but are simply not billing for them, (e.g. for family, friends) you do not qualify for an exemption and must pay the insurance premium and levies. Retired lawyers who are interested in working as volunteers in legal aid clinics may apply to exempt themselves under the insurance program, provided they meet the exemption criteria for lawyers working or volunteering in legal aid clinics, as described in the exemption eligibility. This chart summarizes the coverage based on current status and the type of pro bono work. For additional reading see the LAWPRO Magazine article What’s My Coverage When Working Pro Bono?